Black Lives Matter protesters demonstrate outside the office of Sacramento, Calif., District Attorney Anne Schubert on March 28, 2018, in Sacramento. 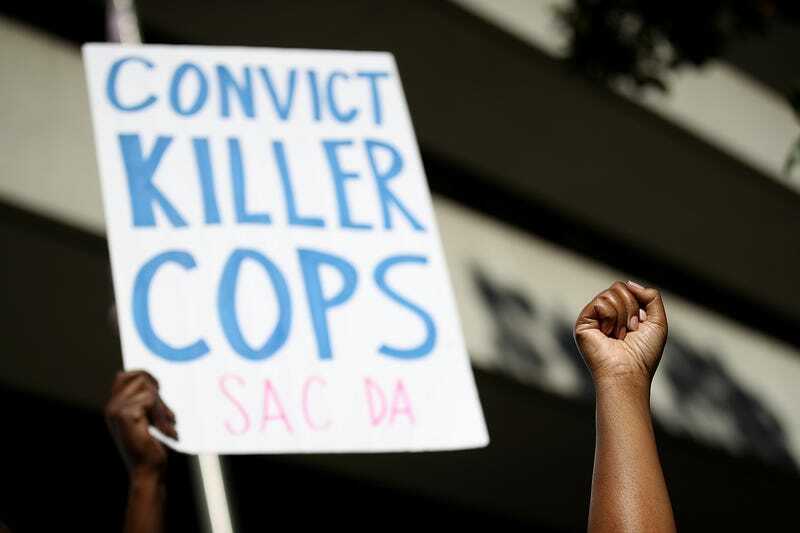 While the shooting death of Stephon Clark has made national headlines over the last two weeks, it is not the first questionable shooting the Sacrament, Calif., Police Department has had. It is just one in a long list of many questionable incidents or activities the department has been linked to. Each and every time there is a police shooting that results in the death of the victim, there is a rush to dig up every bad thing the person ever did, starting from the day they were born. Why don’t we do this for police departments? The Sacramento Police Department is no stranger to bad headlines. Shootings, the beating of innocent civilians for the crime of jaywalking, as well as an underground Facebook page that targets and harasses citizens, black activists and journalists, have all been tied to the department’s name. The Beating of Nandi Cain Jr. In April 2017, video surfaced of a Sacramento police officer beating a pedestrian he saw and attempted to stop from jaywalking. According to the footage, the officer was sitting in his patrol car when he saw Nandi Cain Jr. crossing the street in an illegal manner. When the officer got out of his car to stop him, police say, Cain challenged the officer to a fight. The officer slammed Cain to the ground and repeatedly punched him in the face, the video showed. In July 2016, Joseph Mann—who was described as being mentally ill—was reported to be on the street in Sacramento armed with a knife that had a 3.5-inch blade. Sacramento Police Officers Randy Lozoya and John Tennis attempted to apprehend Mann in a residential area of Sacramento. Dashcam video captured Tennis saying that he was going to attempt to run Mann over with the police cruiser. He missed, and Mann took off running down the street, away from police. Tennis and Lozoya exited their vehicle and chased Mann on foot. When they caught up to him, they both drew their weapons and fired a total of 18 shots, killing Mann within one minute of encountering him. Posts on the page have targeted everyone from shooting victims to Black Lives Matter activists, Sacramento Bee reporters and even Sacramento Mayor Darrell Steinberg. The post defends SPD assertions that the officers who shot Clark were in fear for their lives, questions why Clark was hopping over fences, and even suggests that he may have been intoxicated or on drugs. It downplays the 20 shots officers fired at Clark the night they killed him, saying “it’s only 10 rounds” an officer. The type of inside information that is often posted on the page lends credence to the idea that it is being run by someone connected to the Police Department. In June 2017, spokesmen for the department, the police union and the city all said that because the page has an anonymous administrator, it’s hard to tell who is behind it. All of this is to say that the Sacramento police are no more innocent little angels than the victims they demonize after abusing their power. If we are going to go digging into people’s pasts after a police shooting, let’s start with the ones holding the smoking guns.